By 2005, in the post-The Black Album era, Jay-Z was almost two years into a retirement from releasing solo albums. Kanye West was soon to erase any doubts about a sophomore slump with his second studio album, Late Registration. LeBron James had delivered on the prep hype: He finished his second season with the Cleveland Cavaliers averaging 27.2 points, 7.4 rebounds and 7.2 assists. The best was yet to come for all three, as they stood together on the August 2005 cover of XXL, alongside Foxy Brown, who was signed to Def Jam Records at the time and preparing an album titled Black Roses. Shot by Clay Patrick McBride (whose website opens with a look from the shoot), it was a gatefold cover, and the fold featured Freeway, Memphis Bleek, Young Gunz, Teairra Marie, Peedi Peedi and DJ Clue. Incoming Island/Def Jam CEO Antonio “L.A.” Reid, in one of his first moves, had hired Shawn “Jay-Z” Carter as president of the historic Def Jam Records, and under that umbrella came the relaunch of Jay-Z’s R0c-A-Fella Records — without co-founder Damon Dash. The 2004 split between Jay-Z and Dash was the No. 1 topic in hip-hop. And as for James, he was not signed to any label, but he appeared on the magazine as a symbol of his close relationship with Carter and of Carter’s reach to the world of professional athletes with Roc Nation Sports. The cover idea was President Carter’s cabinet, and the XXL cover captured a moment in time before Jay-Z, West and James, all household names in 2005, were catapulted into another stratosphere of social impact, cultural influence and financial success. More than a decade later, Jay-Z is one of the most successful creative entrepreneurs, West is arguably the most influential cultural figure on this globe, and James, in his 15th NBA season, is still the best basketball player in the world. With Jay-Z transitioning into an executive role, and his recent break-up with Dash, Wilson knew who he could turn to for a splash. “Whenever there was a drought,” Wilson said, “Jay was always relevant.” The cover would serve two purposes: to bump up sales numbers on the newsstands and to have the No. 1 name in hip-hop tell his side of the Roc-A-Fella breakup. For Wilson, who joined XXL after working as music editor at The Source, and at College Music Journal, the hip-hop magazine wars were a real thing. Wilson joined XXL with a goal of outselling The Source at the newsstands within a year. 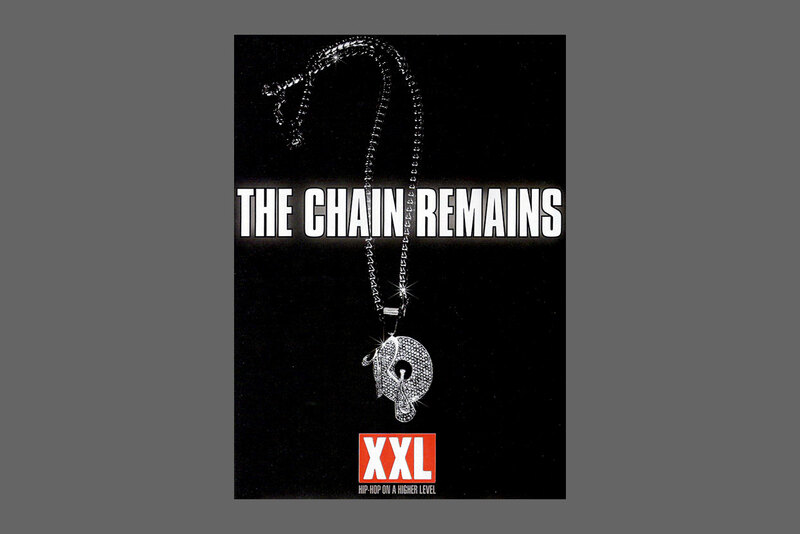 It took him until 2003, and by 2005, Wilson was aiming to cement XXL’s reputation as the go-to music publication. Jay-Z agreed to appear on the cover of the August 2005 issue and even suggested to Wilson his vision of a cover concept. Jay-Z wanted to do a presidential cover to reflect his new role at Def Jam. 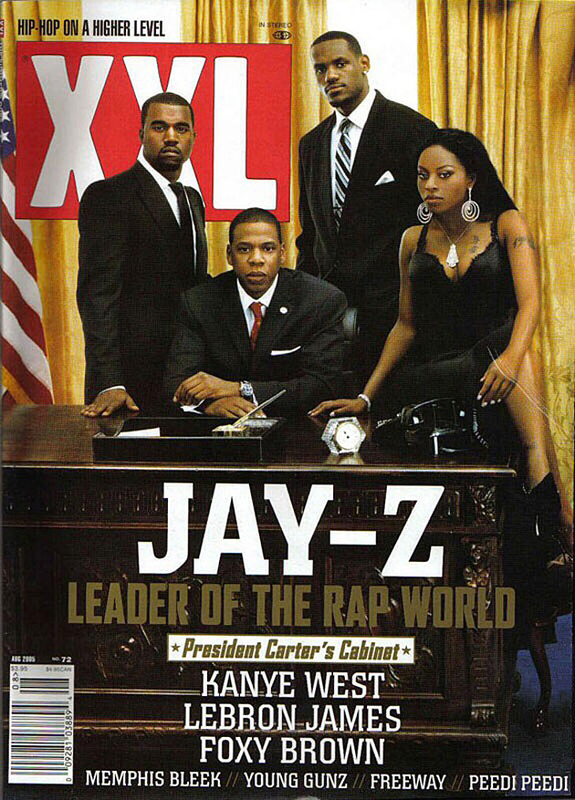 The photo shoot took place at New York City’s Chelsea Piers inside a mock Oval Office, and while all this was going on, team XXL included a teaser for the Jay-Z cover in the July 2005 issue: The last page in the magazine featured a Roc-A-Fella chain displayed prominently. The tagline was The Chain Remains — Wilson drew inspiration from Naughty By Nature’s 1995 “Chain Remains,” from Poverty’s Paradise. When Wilson listened to Jay-Z’s guest verse on West’s “Diamonds From Sierra Leone Remix” there’s the line: The chain remains, the gang’s intact … but the XXL presidential cover actually reflected a more popular line from “Diamonds”: I’m not a businessman. I’m a business, man. Jay-Z, West and James were in very businesslike black suits, and Foxy Brown was in a sleek black dress. Because of Jay-Z’s ownership stake with the Brooklyn Nets, an early version of the cover included Vince Carter and Jason Kidd — instead of James. “I was thankful Vince and Jason didn’t make the [final] cut,” said Wilson. “I knew LeBron … would be a big deal.” It would be a few more years until Barack Obama became the 44th president of the United States, but Jay-Z was making himself an unofficial black president on the cover of a magazine. In the one-on-one interview with XXL features editor David Bry, Jay-Z addressed his split with Dash, saying, “I’m not in the business to talk about guys I did business with — I want you to print all this — been real tight with, for over 10 years. But since there’s so much out there, so much has been said, I will say this one thing: I’ma just ask people in the world to put themselves in my shoes. However the situation happened, whether we outgrew the situation or what have you, it was time for me to seek a new deal in the situation.” Shawn Carter was speaking to Bry. The beloved Bry, an author and hip-hop scholar, recently died of brain cancer. Jay-Z stepped away from his role as president and CEO of Def Jam in 2007. During his tenure, artists such as Young Jeezy and Rick Ross had huge successes. West, Rihanna and Ne-Yo became global stars. At the same time, projects involving Ghostface Killah, Method Man, Beanie Sigel, Memphis Bleek and the Young Gunz sputtered. Artists such as LL Cool J spoke out in frustration. Jay-Z also came out of “retirement” and released Kingdom Come in 2006, to mixed reviews. Questions were raised about whether Carter was focused as a music executive, and whether there were creative conflicts of interest. Alex Wong is a freelance writer based in Toronto. If anyone has a Michael Dickerson Vancouver Grizzlies replica jersey, please contact him.